When remodeling or building your own home you want your entry way to be inviting, yet secure. 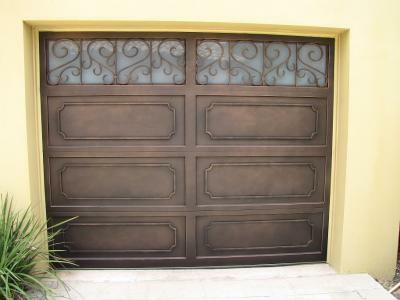 Signature Iron Doors crafts iron entry doors, garage doors, railing, gates, and any other iron work. Our purpose is to offer a product that will exceed remodelers and builders vision. It isn’t just the 14 gauge steel that brings pleasure to the eye; it’s the craftsmanship along with it. Every piece of iron is hand forged by licensed welders under the design of our technicians. While we offer an array of our own designs, we specialize in custom iron work, so our designers work right with you in the design process. Whatever scroll work, straight bars, or solid iron pieces you want, we can provide. Each door comes with dual panned tempered glass. Signature Iron Doors is now leading the iron work industry in the Phoenix valley and if you visit our showroom you will see why. Here are just a couple of our doors we built for customers near Chandler Arizona. 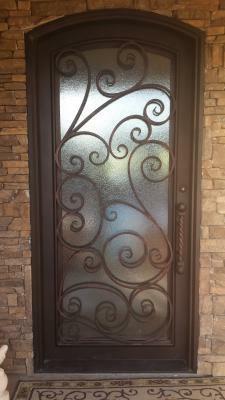 It’s our guarantee that your home will be enhanced in both security and beauty with a Signature Iron Door. Come visit our showroom off Southern and 40th street to meet with our sales team and find out about your iron door options.